After my first successful attempt at shooting the Perseids meteor shower I became addicted. I have shot 2 other meteor showers since then and have more planned for the future. Photographing a meteor shower can put quite the stress on your camera, especially the battery. Cold conditions in the mountains and taking continuous 30 second exposures for an entire night eats them up quickly. I was able to change the batteries easily enough because I have an MB-D10 battery grip that holds an additional battery. But this required me to change out the battery every 2 hours which made for a long night, plus I had to borrow extra batteries to make it through the night. 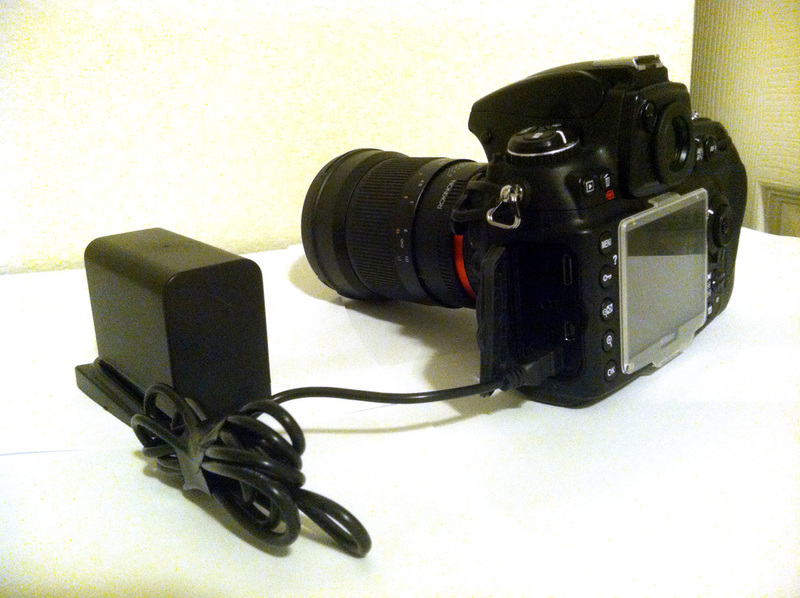 I decided there must be a better way, I knew of the EL-5 AC adapter which allows you to hook up your camera to an AC power source. Since I obviously cannot plug in to an outlet in the mountains I figured a jumper box with an outlet would do the trick. After researching this further I realized that this was not the optimal solution, the conversion from DC to AC, back to DC is extremely inefficient, plus lead acid batteries are very heavy. 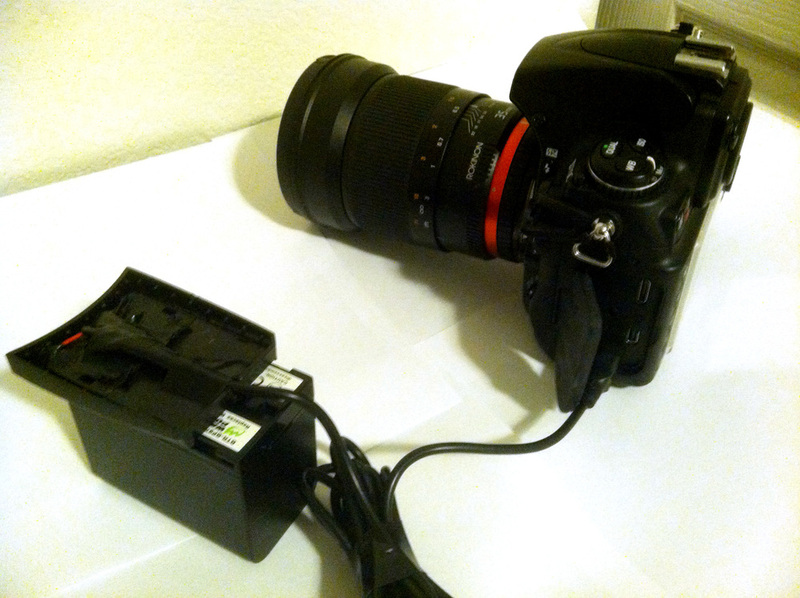 I finally came across this article DSLR Battery Hack for Timelapse that hacks up a cheap EN-EL3e to attach an external battery through this shell battery. This was a great idea and I almost ran with it, but I thought there had to be an even better way. The DC plug on the D700 was taunting me, surely if I hooked up the battery to this I would be set, but a thorough Google search returned nothing, I couldn’t find anyone who had done this before. I was scared to fry my baby, I forged on though. The standard Nikon EN-EL3e has 1500mAh. When shooting the Perseids meteor shower I went through 5 batteries in 8 hours. So I’m assuming 1.6 hours for 1 battery in the cold. This is a high capacity battery for a Canon camcorder that puts out the same voltage as the D700’s battery, I wanted the voltage to be the same so I didn’t have to put a regulator in the mix. Here’s the cool part; 8500mAh. That’s nearly equivalent to 6 EN-EL3e batteries! It should last for a little over 9 hours in cold conditions. Also the power to weight ratio is much better. An EN-EL3e weighs 2.8oz and the Wasabi with the plate and cord weighs 11.5oz. So the EN-EL3e is 535mAh/oz and the Wasabi is 739mAh/oz. This battery alone may be a great option for the ultra lightweight backpacker going on a week or 2 long trip. This is a super cheap knock off of the Nikon EL-5, don’t waste your money on the Nikon version, all we’ll be doing is cutting off the wire to use the proprietary plug to connect to the D700. A charger for the new battery. This is just a dummy plate I found that will hold the battery when shooting and make the connection to the battery. Versus 1 D3 battery (EN-EL4a) which costs $109 and only has 2500mAh, since the EN-EL4a replaces the battery in the MB-D10 grip you would have a total of 4000mAh, still less than half of just this one battery. The beauty of this setup is that I can still use my EN-EL3e batteries in the camera and the MB-D10, so with the new battery I have a total of 11,500mAh! Nearly 12.5 hours of shooting! Eventually when I get a D800 I will add the Nikon EP-5B because they decided to omit the DC jack. Or I will build my own version of this with a cheap hacked up EN-EL15. The unfortunate part of this is the need to use one of the battery slots, either in the camera or in the grip, meaning less overall power. I may play around with wiring it directly to the battery and leave the cells in place so that battery can still be used. Next, grab the EL-5 and cut off the wire that comes out of the ‘black box’, leave a little to spare if you ever want to use the AC adapter. Strip back the covering, you’ll find wire just under the black covering, this is the ground wire. There will be another white coating below this, strip this back to find your positive wire. Now you will need a soldering iron preferably or you may be able to get away with wire connectors that you can pick up at any auto parts store. Solder together the positive wire from the EL-5 cable to the red wire in the adapter plate and do the same for the ground wire to the black wire on the adapter. Put some heat shrink tubing or electrical tape around these connections. You can drill a hole in the adapter for the wire to exit from and put the back plate back on. That’s it. Make sure your new battery is charged and slip it in the adapter. Plug the wire into the DC port on the D700. Suddenly you have all the power you’ll ever need. The only downside is you can’t see how much battery life is left. I tested this out on the Orionid meteor shower and shot for 6.5 hours, I still had life left in the new battery, but I don’t know how much was left. I’ll need a longer night to know for sure. Overall I’m incredibly happy I built this, I’ll also be using it for milky way shots and for timelapses. It’s lightweight and small enough to take along for hikes. I may even take this backpacking so I can do night timelapses without the fear of having no batteries for the rest of the trip!